Living on the West Coast is a real delight (despite what some Torontonians may say), and it only takes one look out the window when you’re riding the train to remind you of how lucky you are. When it comes to looking for a home that you can finally call your own in Metro Vancouver, you want to have it all (within your budget). You want to invest in a place where you find lush green spaces around every corner, and you know your neighbours by name. And now you can find this balance at Alexander Square in Willoughby, Langley. The new master-planned community by local developer RDG Management Ltd. is bringing two residential buildings to Willoughby Town Centre; Alexa and Xander. Containing more than 300 affordable one-and two-bedroom homes, Alexander Square is where you’ll want to live. To help you see why this could be your new home, here are five reasons why Alexander Square needs to be on your radar. Affordability is going to be one of the first things on your mind when you’re looking to buy a place. After all, you need to know whether you will be able to manage the cost of your mortgage repayments on top of all of your other expenses. We’ve got good news: 300 homes at Alexander Square are expected to be under $600,000, so it’s fair to say they’re priced to move. Regardless of where you’ve lived in the past, you need to make sure the location of your new home works for you and your family. This includes having access to essential amenities. 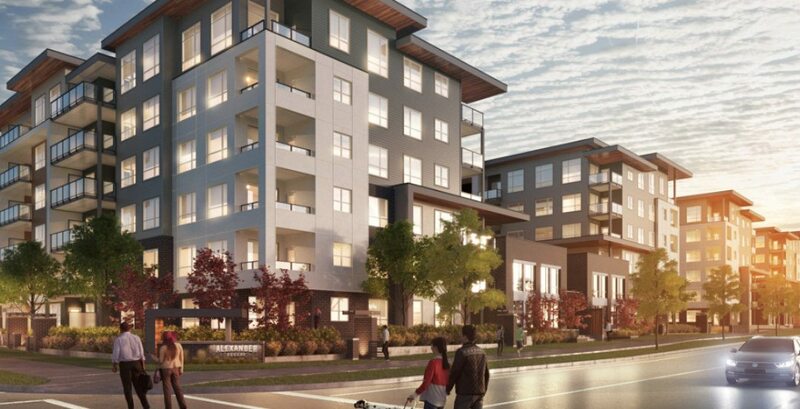 You’ll have this at Alexander Square in the heart of Willoughby’s urban centre with Willoughby Mall, Walnut Grove, and the Historic Fort of Langley just a short drive away. Additionally, you’ll have easy access to Highway 1, Golden Ears Way, Fraser Highway, as well as transit options providing access to Vancouver. Home is where the heart is, and you need to feel comfortable in your space. Each home at Alexander Square has been designed by The Creative Designworks. Each unit boasts a minimal colour palette and a functional layout, which work together to give you a bright, airy, and expansive space for you to live your life. When you feel like going outside to catch up with neighbours and friends, you can do so in the landscaped courtyard or on the common rooftop patio. You’ll also find an entertainment lounge and full kitchen on the rooftop, too, where you can host all of your parties. Since 2013, Willoughby has steadily been growing into an active urban centre and when you’re living here, you’ll have access to all the amenities you could possibly need. This includes everything from Yorkson Creek Veterinary Hospital (important if you have pets), Era Hair Studio, G&F Financial Group, Town Centre Liquor Store, RBC Royal Bank, Sassy Nails & Spa, ICBC Driver Insurance, and more. There will always be those nights when you don’t feel like cooking or you want to go out to celebrate a special occasion, and it’s refreshing to know that you don’t have to leave your neighbourhood to make that happen when you live at Alexander Square. You have plenty of options when it comes to dining like The Keg, Noma Sushi, Moxie’s Grill and Bar, White Spot, The Old Spaghetti Factory, and Mad Italian Pizza Company. Cineplex Cinema, Langley Events Centre, Willoughby Community Centre, Walnut Grove Community Centre, and Langley Sportsplex, are also in the local area. And we can’t forget about The Redwoods Golf Course if you want to play a quick nine. You can register for your dream home at Alexander Square here. Or you can visit the presentation centre on 66th Avenue before then to explore the many different options available to you.